Prince, priest, and missionary, Demetrius Augustine Gallitzin was born at The Hague on December 22, 1770; he died at Loretto, Pennsylvania on May 6, 1840. He was a scion of one of the oldest, wealthiest, and most illustrious families of Russia. His father, Prince Demetrius Gallitzin (d. 16 March, 1803), Russian ambassador to Holland at the time of his son’s birth, had been previously for fourteen years the Russian ambassador to France, and was an intimate acquaintance of Diderot, Voltaire, d’Alembert, and other rationalists of the day. Though nominally an Orthodox Russian, he accepted and openly professed the principles of an infidel philosophy. On August 28, 1768, he married in Aachen the Countess Amalie, the only daughter of the then celebrated Prussian Field-Marshal von Schmettau. Her mother, Baroness von Ruffert, being a Catholic, Amalie was baptized in the Catholic Church, but her religious education was neglected, and it was not until 1786 that she became a fervent Catholic, which she remained until her death on April 27, 1806. Little attention was paid to the religious education of Demetrius, who was born and baptized in the Greek Orthodox Church. In youth his most constant companion was Frederick William, son of William V, then reigning Stadtholder of the Netherlands. This friendship continued even after Frederick William became King of the Netherlands and Duke of Luxemburg as William I. Almost from his infancy the young prince was subjected to rigid discipline, and his intellectual faculties, trained by the best masters of the age, reached their fullest development. At the age of almost seventeen Demetrius became a sincere Catholic, and to please his mother, whose birth (1748), marriage (1768), and First Holy Communion (1786) occurred on 28 August, the feast of St. Augustine, assumed at confirmation that name, and thereafter wrote his name Demetrius Augustine. 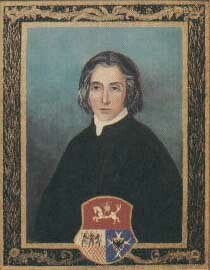 After finishing his education he was appointed aide-de-camp to the Austrian General von Lillien, but as there was no opportunity for him to continue a military career his parents resolved that he should spend two years in traveling through America, the West Indies, and other foreign lands. 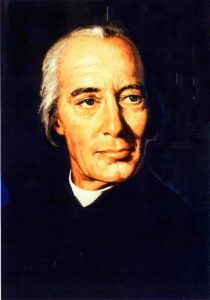 Provided with letters of introduction to Bishop John Carroll of Baltimore, and accompanied by his tutor, Father Brosius, afterwards a prominent missionary in the United States, he embarked at Rotterdam, Holland on August 19, 1792, and landed in Baltimore, Maryland on October 28. To avoid the inconvenience and expense of traveling as a Russian prince, he assumed the name of Schmet, or Smith, and for many years was known in the United States as Augustine Smith. Soon after arriving at Baltimore, he was deeply impressed with the needs of the Church in America. He resolved to devote his fortune and life to the salvation of souls in the country of his adoption. Despite the objections of his relatives and friends in Europe, he, with the approval of Bishop Carroll, entered St. Mary’s Seminary in Baltimore as one of its first students. St. Mary’s had been founded the previous year (1791) by Sulpician priests, refugees from France. On March 18, 1795, Demetrius was ordained a priest, being the first to receive in the limits of the original thirteen of the United States all the orders from tonsure to priesthood.